This is the talk, with a few illustrations, that I was invited to give on August 15 at the Island Institute, a remarkable organization headquartered in Rockland, Maine, that promotes, celebrates and sustains the culture of Maine’s island and coastal communities. I began by reflecting on the deep ignorance most Americans entertain about aquaculture, what it is and how dependent we are on it. I’m sure most of you in this room are more knowledgeable than that, but I cannot tell you the number of times I’ve mentioned aquaculture to someone who says “Oh, I never eat farmed fish.” Or the famous chef who assures restaurant clients that only wild fish is on the menu—just as he or she serves a beautifully grilled branzino or daurade straight from a Greek, Italian or Spanish fish farm. The fact is that more than 50%, more than half, of all the seafood consumed worldwide comes from farms of one kind or another, whether it’s scary shrimp from an environmentally destructive farm off the Vietnamese coast or a salmon raised in the cold clean waters of Cobscook Bay according to Maine’s strict environmental rules. So: You say you never eat farmed fish. I say it’s quite possible you don’t actually eat any other kind. There’s another statistic, equally relevant and perhaps even more startling. That is that somewhere between 90 and 95% of all the seafood consumed in this country is imported. Ninety-five percent. It is one of the US’s biggest balance of payments problems. And a lot of that actually comes from US harvests that are then shipped to Asia for growing out and processing—whether it’s Alaska pollock that’s turned into surimi, the “fish” you get sometimes in sushi restaurants, or elvers from Maine that are sent to China to be grown into full scale eels—again an important item on sushi menus. 95% of seafood is imported and more than half of that is farmed. Where does Maine fit in this picture? For background, let’s take a look at our wild resource. I’m sure I don’t have to point out to anyone here that our fish populations are declining, sometimes dramatically. They are overfished and, many would argue, over-regulated to boot: cod, to begin with, and haddock to a certain extent, but then: Maine shrimp which we haven’t seen for five years; elvers (there are currently 468 licensed fishermen, and no hope of that increasing); sea urchins which were fished practically to extinction to supply the Japanese market; halibut which are listed as endangered; wild clams and mussels in diminishing supply. One after the other after the other, boom and then bust. On top of that, our fish have to cope with warming waters—the Gulf of Maine, for peculiar reasons, is warming faster than almost any other body of water, and acidification is attacking the very base of the food chain that supports it all. And on top of that, on land you’ll find that our fisheries are all crowded and competitive with no opportunity for newcomers to break in. the add-ons, upstream and downstream, in terms of taxes, employment at processors, transportation, value added products (think of all those lobster mac & cheese frozen dinners)–plus the tourism that lobster brings in. And the restaurant sales that depend on lobster. An impact study of Maine’s lobster industry done at Colby College actually reached a value of $1 billion, supplying a full 4,000 jobs. But why does lobster make anyone nervous who stops to think about it? Well. . . the waters are warming and the lobsters have deserted Long Island Sound and the south coast of New England and slowly, slowly, moved north. And they will not stop moving as long as the water keeps warming until they get to Canada. Or beyond. This whole valuable fishery, on which we depend almost exclusively, will go with them. Whether it’s imminent, or ten or twelve years down the road, the eventual decline of the lobster fishery is a given. 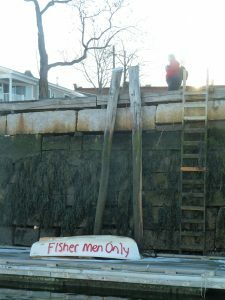 So what do we do when fisheries are closed or so limited that new young people can’t break into them? 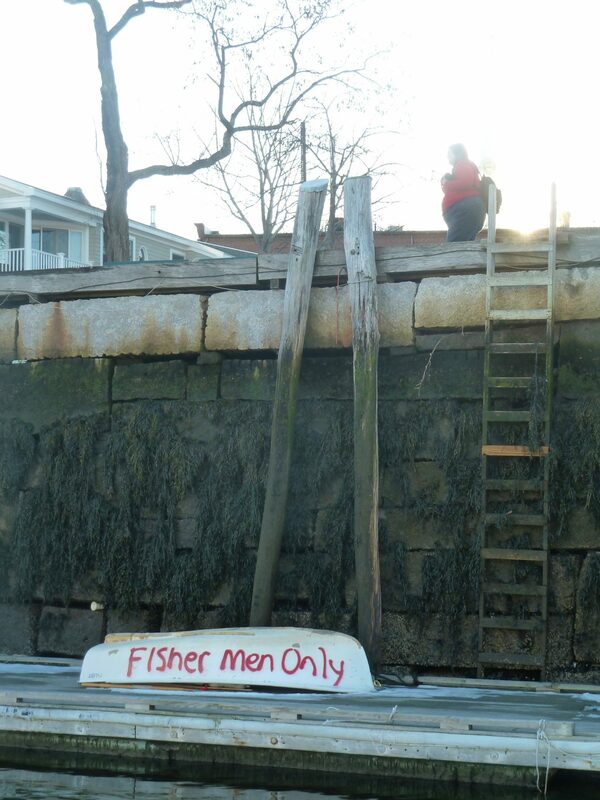 What do we do to maintain waterfront communities that have defined the coast of Maine for the last 250 years if not longer? That’s where aquaculture provides an alternative. What aquaculture means for Maine is something fishing communities can do, support, turn to as an alternative to lobstering, whether supplementing lobsters or replacing them altogether, and still manage to keep the money and the spirit and the local culture right there in the community. The coast of Maine has always depended on a seafood economy. Aquaculture, responsible aquaculture, is one strong way to keep that going. 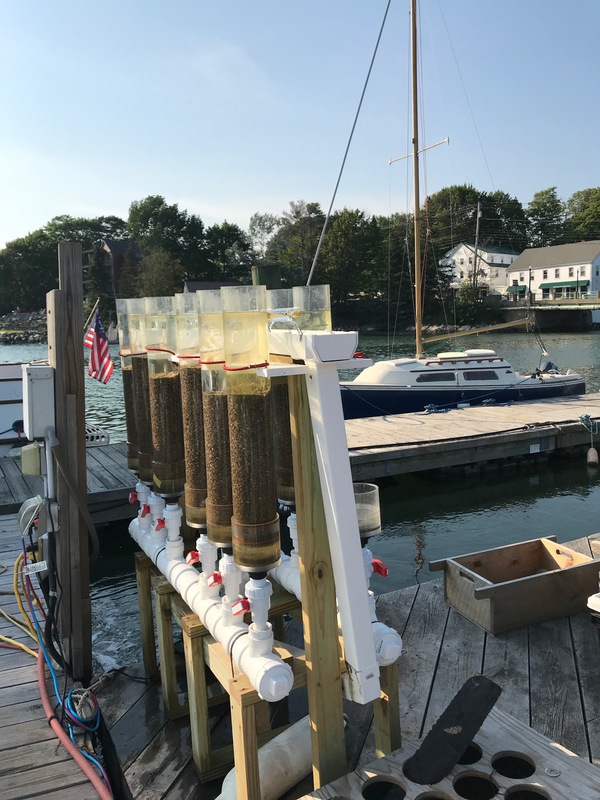 When I set out to look at aquaculture in Maine, I expected to look at salmon and oysters but I found instead a mind-blowing amount of experimentation that will lead to very significant results. In the world perspective, our contribution is insignificant. Out of the total hundred billion dollars produced by aquaculture worldwide, the US contributes just 1 percent. 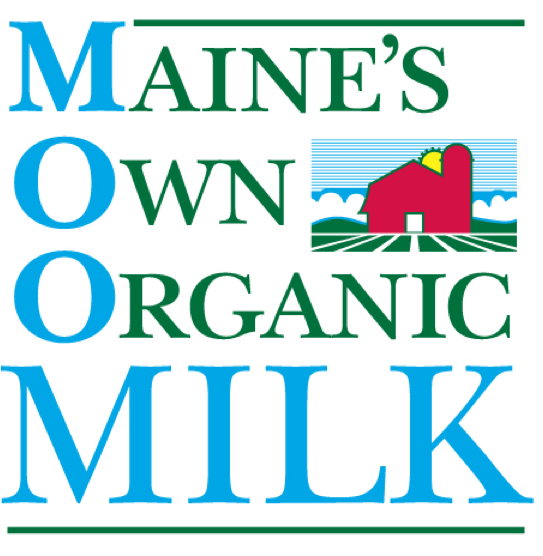 But Maine on its own produces and markets more aquacultured products than any other state. And we could be doing so much more. 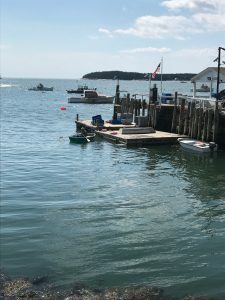 According to Sebastian Belle of the Maine Aquaculture Association, there are 190 active lease sites in Maine waters and there are an additional 450 LPAs, a figure that translates into 125 or so people prospecting. 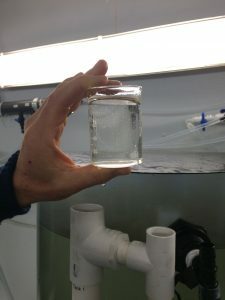 (LPA is “limited purpose aquaculture,” a preliminary test lease, offered for just a year to test out a prospective site.) Belle estimates another 35 to 40 leases in the pipeline. So there are perhaps as many as 350 people altogether actively working right now in aquaculture of one sort or another. 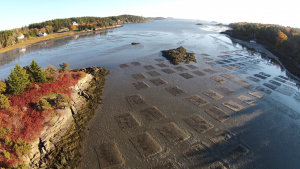 Well, soft shell clams are example: This is a view of the Heel Eddy Clam Restoration Project in Georgetown, sponsored largely by Manomet, an environmental research organization.The flats are seeded and covered with nets to protect from voracious green crabs. But protecting against green crabs isn’t enough so they’ve now put another protection beneath the flats to guard against milky ribbon worms. The project, now in its third year, turns out to be a good deal more challenging than originally thought. Still this is one of four or five sites Manomet is involved with, although quahogs (hen clams, hard shells, cherrystones) may be better candidates for aquaculture, their shells too tough for predators. Oyster are much less challenging to raise and much more profitable. 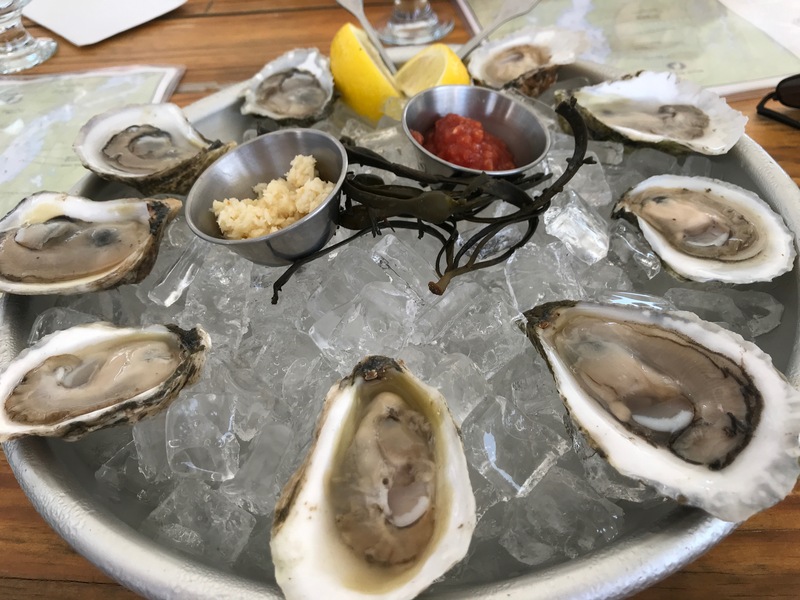 These were presented at a restaurant called the Shuck Station, in an old filling station on Maine Street in Newcastle, where Brendan Parsons opens Damariscotta River oysters as fast as he can. The Damariscotta river system is an especially ideal habitat for these bivalves. First because it’s a big estuary running 12 miles up from the ocean, and tidal all the way to Damariscotta, its waters constantly moving up and down with the tides. But there are two other reasons for this amazing development—one is the location of the University of Maine’s Darling Marine Center on the river banks at Walpole. The Darling Center has had a huge influence on all kinds of aquaculture start-ups, but especially on oysters. And the other reason is a remarkable man named Ed Myers, who began cultivating mussels in Clark’s Cove, right next to the Darling Center, in 1975 when he received Maine Aquaculture Lease Number 1. Mussels led to oysters and the rest, as they say, is history. Pemaquid Oyster Farms has its nursery right on the docks in Damariscotta. Eventually these baby oysters will be transferred down off Clark’s Cove to grow to maturity. But oysters are everywhere: Today there are at least 80 oyster farms all along the coast and islands, but tomorrow there will be even more because this is a constantly expanding enterprise and everyone involved says the supply will not exceed demand for a long time to come. All you have to do is look at the number of oyster bars that are opening up, like the Shuck Station or Ondine in Belfast or Eventide in Portland, one after the other, all along the coast. 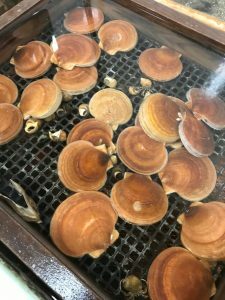 Another piece of this oyster enterprise is growing seed culture for oysters. Muscongus Bay Aquaculture has had great success providing Maine oyster seed all up and down the east coast, from Florida to Canada. Mussels are a historic target for aquaculture, especially valuable as our wild mussel populations are dying off. They have been raft-grown starting with the legendary Ed Myers back in 1972. They’ve had their ups and downs but are currently farmed in Frenchman’s and Blue Hill Bays, in Casco Bay—most famous are Calendar Island and Bang’s Island, identified as such on top restaurant menus. At the forefront of these developments is Carter Newall who has worked out a submersible raft that can be set up three or four miles off shore as a way of avoiding predatory ducks that can consume a raft of mussels for breakfast and come back for another for lunch. A somewhat unlikely and certainly unusual candidate for aquaculture in Maine is eels. 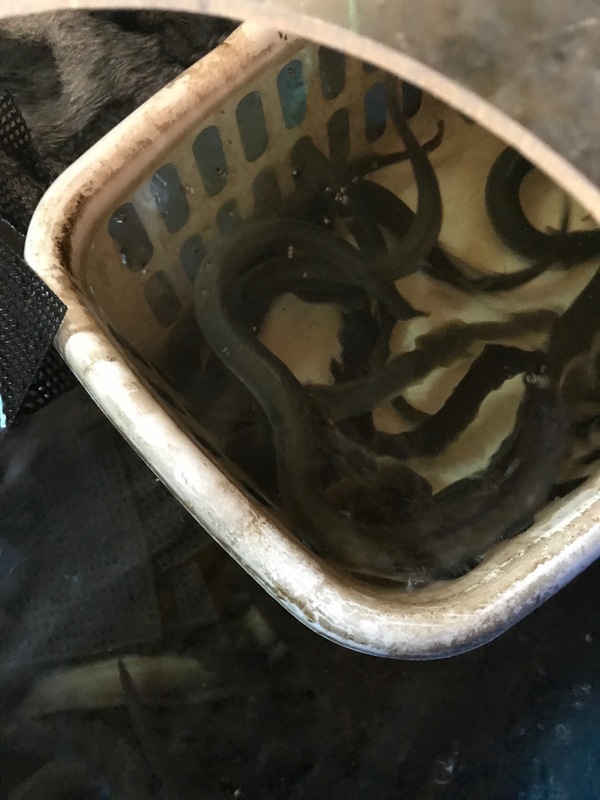 For many years we’ve harvested wild elvers when they come up our rivers in the spring, shipping them off to China to be grown, slaughtered and sent back here. It’s a lucrative business but wouldn’t it be more lucrative to keep the eels right here and raise them up as true Mainers? Sara Rademaker, who started at the aquaculture innovation center in Walpole, is about to launch forth with her own independent enterprise. She told me we import an astonishing 5,000 metric tons from China annually—most of it for the sushi trade. 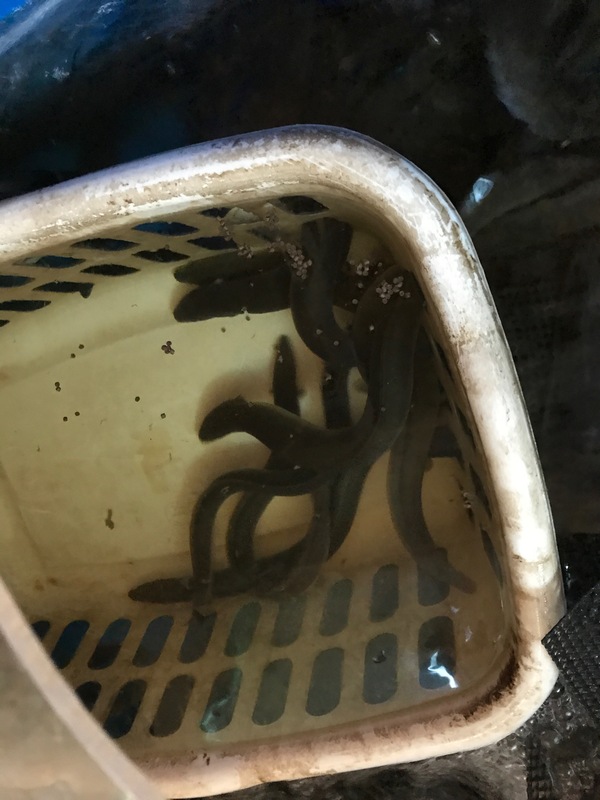 Hers is an RAS, land-based Recirculating Aquaculture System—and I’ll go into that a bit more when we talk about salmon because that’s where the biggest news is. But with her new system, she will be up to 120 metric tons by the end of next year—and ready to make a dent in that China trade. 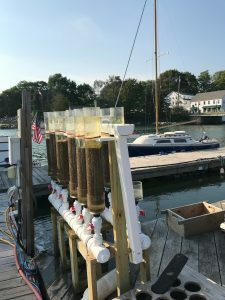 And then there’s seaweed: CCAR, the University of Maine’s Center for Cooperative Aquaculture Research in Franklin’s Taunton Bay, has spearheaded seaweed research and supported start-up seaweed enterprises like Sarah Redmont’s Springtide. But that isn’t the first. Ocean Approved, in Casco Bay, is more than ten years old and Ocean’s Balance, another seaweed farmer, is right up there with them. And then there’s Maine Fresh, where Seth Barker and Peter Fischer provide fresh kelp from that same Clark’s Cove where so much is happening. There’s a lot of excitement about seaweeds, the medicinal and supplement market is strong, but it’s not clear who is going to be buying and eating it all. Still, chefs are very interested, the environmental aspects are heartening as it helps to restore carbon balance in the water, and it’s a great prospect for lobster fishers especially because you can plant a seaweed crop in the fall, after you’ve hauled your traps, and harvest in the late spring before you set traps again. And beyond all that, it is probably the most economical aquaculture to get into, with very minimal start-up costs. 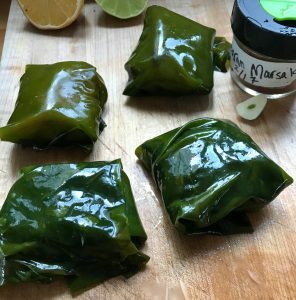 As for eating it, cooking with it, I made kelp-wrapped monkfish fillets with some fresh kelp from Maine Fresh (see recipe below). What did the kelp do? It added flavor to bland old monkfish and it also tenderized it and reduced its unfortunate rubberiness. The next big thing for Maine aquaculture is most likely going to be scallops. These ones are growing out at the Darling Center’s incubator but the culture eventually is going to be quite different and already there’s a great deal of interest, especially because, if I understand it correctly, the scallops will be pinned individually to ropes. This is something developed in Japan and the machinery is on its way here, or maybe already here, and the best thing of all, from the cook’s perspective, is that it may be possible to sell scallops with their roes attached, something we haven’t seen in this country in my lifetime. What else is in the pipeline? Halibut: it’s farmed in Norway, where they’re producing half the Alaska catch of wild halibut, and there’s no reason it could not be farmed in Maine. Sturgeon? It’s a fish that’s native to Maine and shows great capabilities for aquaculture. Yellowtail (hamachi) was being produced in Franklin but it proved hard to grow; as a tropical fish, it needs warmer waters. But I can tell you from personal experience, it was a superb eating fish. And there’s a lot more experimental stuff going on, especially at the University of Maine center in Franklin: sandworms (don’t laugh—they’re valuable for bait) and these baby sea urchins, little bits of protoplasm that you can’t eve see but that will actually grow up to be urchins. Did I say lobster? Yes, a lot of folks claim that lobster is a primitive form of aquaculture because the fishermen are actually feeding the lobster population and training it to come and go in the traps. And finally there’s the elephant in the room, salmon. We have for years been the beneficiary of Cooke Aquaculture’s vigorous promotion of salmon farming, mostly Down East in Cobscook Bay where they operate 22 farming sites. And Cooke has equally been a beneficiary of Maine’s stringent environmental rules governing safe, sustainable salmon farming. The Atlantic Salmon Federation, which works to protect wild salmon populations, hails Maine’s farms as an example that all salmon aquaculture around the world should follow. And not only that, but the Monterey Bay Aquarium, with its Seafood Watch program, gives a yellow light to Cooke’s Maine-raised salmon, available in your local Hannaford’s as Northern Harvest brand. That’s not quite a green light but it’s the next best thing. The only Atlantic farmed salmon that gets a higher grade from Monterey Bay is salmon raised by RAS—recirculating aquaculture systems. These are land-based systems in which the salmon never go anywhere near the open ocean. They are raised in enclosed tanks with elaborate filtration systems for both the intake of water and the effluent or outflow. And that is very very big news in Maine because we have not one but two proposals, one on the heels of the other, for very large RAS systems to be established, one in Belfast by a Norwegian company called Nordic, the other in Bucksport on the site of what was once a Great Northern paper mill, right on the banks of the Penobscot River. There have been screams of outrage from Belfast residents, a lot of them voicing very old-fashioned objections to salmon farming in general, but others with some credible environmental doubts. In Bucksport, on the other hand, the community seems, at least so far, to be simply relieved to be rid of an eyesore on the river front. That is a Maine-based company called Whole Oceans. 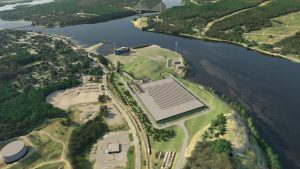 This is an architect’s rendering of what that site will look like eventually, with the Penobscot Narrows bridge and Verona Island in the background. Both of these projects propose to produce what seems like an astronomical amount of salmon—the Belfast project will be one of the largest fish farms in the world, eventually producing 33,000 metric tons of fish annually. The more modest Bucksport site should produce 20,000 tons by the time it’s fully operational. The US is the largest single market for salmon in the world so it makes sense to grow it here rather than importing it from Chile or Norway or Scotland. There are some legitimate objections that should be heard, especially in terms of environmental siting, but in the end these two projects mean jobs and income for Maine’s waterfront communities and better fish for our voracious markets. And that can’t be wrong. A group called Focusmaine, which has charged itself with figuring out Maine’s economic future, has targeted three areas where Maine could excel: one is biopharmaceuticals, another is agriculture, but the third, strongly advocated, is aquaculture, which, the group says, could add as much as 17,000 new jobs by the middle of the next decade. Seafood consumption is constantly increasing, both nationally and internationally, so the market is there. Maine’s reputation, Maine’s brand, if you will, is for producing an honest product in a world where honesty is in short supply. 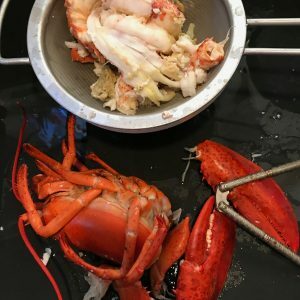 Maine also boasts a clean environmental record, as well as a population that knows what it’s talking about when it comes to seafood, whether it’s procuring it, processing it, or putting it on the table. In the end it’s all about sharing the waterfront for the benefit of all of us. 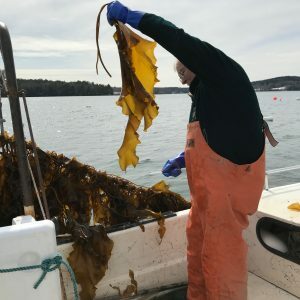 Aquaculture in Shared Waters is a program the University of Maine’s Dana Morse has developed to bring together fishers, farmers, and communities with a stake in preserving our way of life on the coast of Maine. 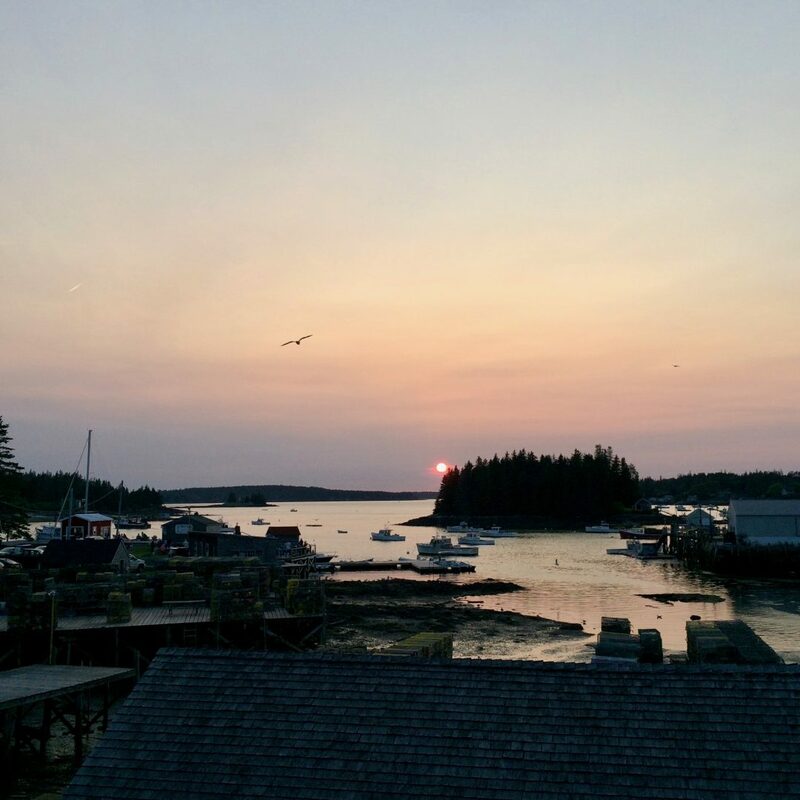 Even those of us in the service trades, hotels and restaurants, understand that without a functioning working waterfront, Maine is nothing but another stop on the endless bucket list of tourism. It should be–and is–so much more. Aquaculture, along with fishing and strong coastal communities, can help to keep it that way. Monkfish is a seafood that I’ve never been able to warm to, possibly because it’s sometimes called “poor man’s lobster,” and my attitude to that is, well, why not eat the real thing? Its firm texture is seen as a virtue, meaning it stands up well to just about any cooking technique. However, wrapping it in blanched kelp, I discovered, gives it more pronounced flavor and totally compensates for its lobster-like chewiness. Cut the monkfish fillet into 4 equal serving pieces. Pat the pieces dry with paper towels and set aside. Bring a large pot of water to a rolling boil. Have ready a big bowl of iced water. When the water is boiling, drop in the kelp leaves, stirring them to make sure they are completely immersed. Blanch the leaves for 15 to 20 minutes or until they turn from reddish brown to bright green. As soon as they do, remove from the boiling water and plunge into the ice water. When the kelp leaves are cool enough to handle, spread one out on a counter top and cut a square piece large enough to wrap one of the fish pieces, just as if it were a Christmas present. Set the fish piece in the middle of the kelp square and sprinkle with salt, pepper, and minced herbs. Top with a thin slice of lemon and about a teaspoon of olive oil, then wrap the kelp square up and around the piece of fish. When it’s thoroughly wrapped, set it aside and proceed with the rest of the fish. Turn the oven on to 350º. Add a tablespoon of oil to the bottom of an oval gratin dish just large enough to hold all the fish. Add the tomato sauce and mix with the oil, then arrange the kelp-wrapped fish on top of the sauce. Spoon any remaining olive oil over the top of the wraps and transfer the dish to the oven. Bake for about 20 minutes, or until the fish is thoroughly cooked. Remove and serve immediately, with more lemons to squeeze over if you wish. Note: You might be tempted to remove the kelp wrapper, but don’t! It is tender and delicious and adds immeasurably to the flavors of the dish. What Do You Know About Your Extra-virgin?